My grateful thanks to Margaret Stead and David Sylvester for sending me the photographs below and giving me permission to use them on this website. The wedding photo of Richard Henry (“Harry”) Sylvester and Fanny Atcherley [ ]. The couple lived at Chase Terrace in the parish of Burntwood, Staffordshire and their marriage took place on 21 April 1919 at Chasetown in the adjoining parish of Hammerwich. Here is the central portion of the wedding photo, showing the happy couple in more detail. Both Fanny and Harry were aged 25 when they wed. 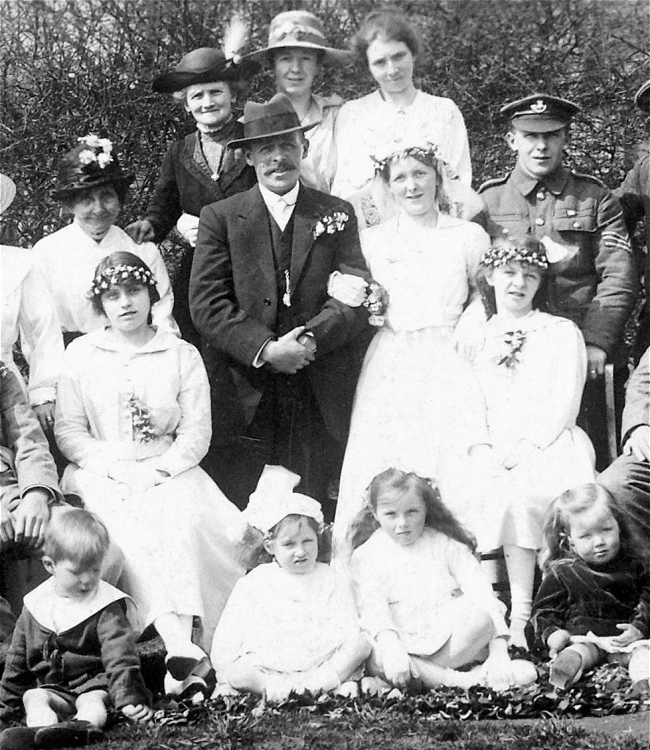 The Army Sergeant standing to the right of Fanny (with the insignia of the King’s Shropshire Light Infantry clearly visible on his cap) is believed to be Fanny’s brother John Atcherley [ ], who was inevitably known as Jack. The identities of almost all of the other people in the picture remain a mystery, though there is plenty of scope for speculation! 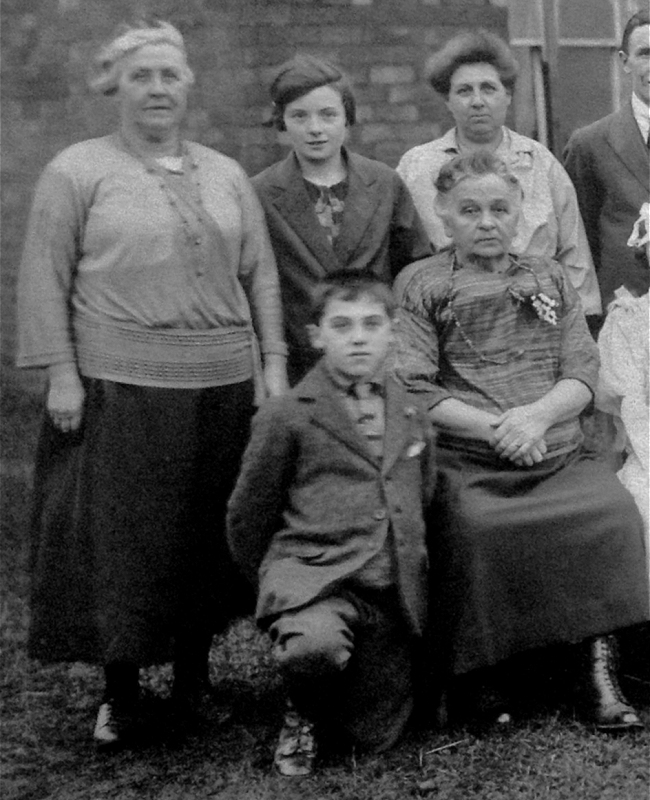 Could Fanny’s step-mother Jessie Atcherley (nee Thacker) be one of the ladies standing at the back? 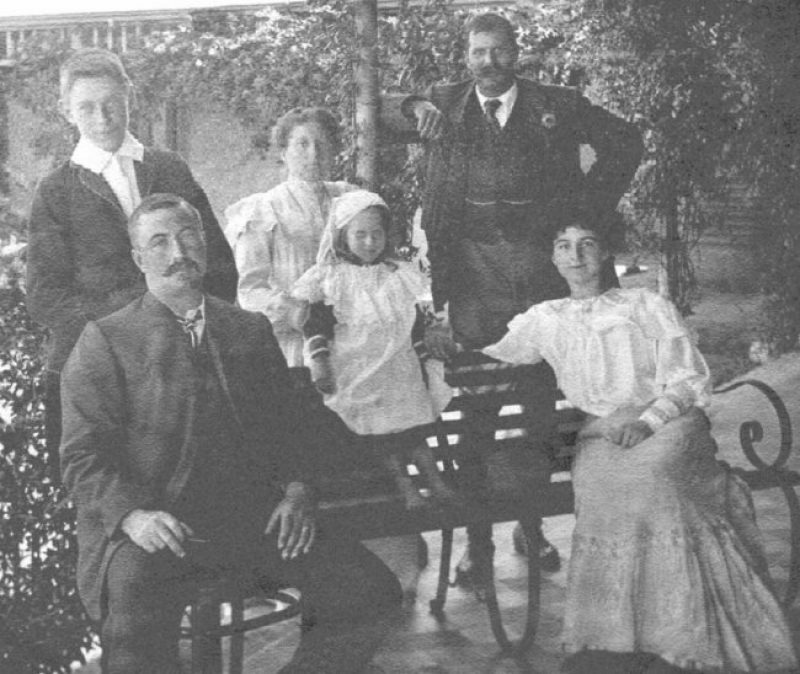 Jessie would have been nearly 50 at the time, and a widow, having lost her husband (Fanny and Jack Atcherley’s father Samuel Atcherley) in 1914. 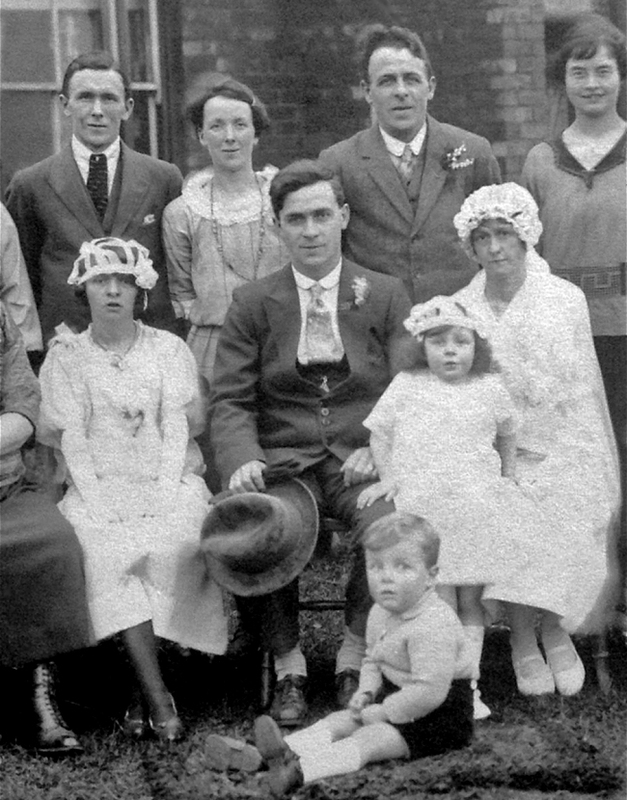 The young cap-wearer in the section of the wedding photograph shown above looks exactly like my youngest brother did when he was a lad. This originally led me to speculate that he was our grandfather Fred Atcherley, aged 10, attending his step-sister’s wedding (or alternatively that my brother was a secret time traveller as a child). However the boy has now been identified as 14-year-old John Thomas Fowell, who was adopted by Fanny and Jack Atcherley’s uncle and aunt Richard Atcherley [ ] and Hannah (Green). 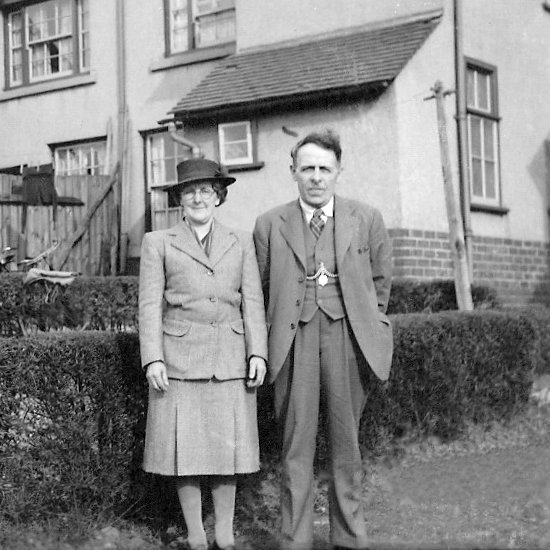 Richard and Hannah Atcherley were living in Cannock Road, Chase Terrace on the 1911 census, and the Spring 1919 electoral register for the Chase Terrace Polling District showed that they were still there then. Richard signed the marriage register as a witness and so he was certainly present at the wedding. I think therefore that it is reasonable to suggest that the older flat-capped chap standing at back left here (next to the Sergeant) was Richard. And I suspect that the woman in the picture was Hannah (compare her with the woman known to be Hannah in one of the pictures below). What an amazing and intriguing photograph this is! Six years after their own wedding, Harry and Fanny Sylvester were among those who celebrated the marriage of Harry’s brother Charlie Roland Sylvester [ ] (known to many as Roland) and Alice Rene Harvey. 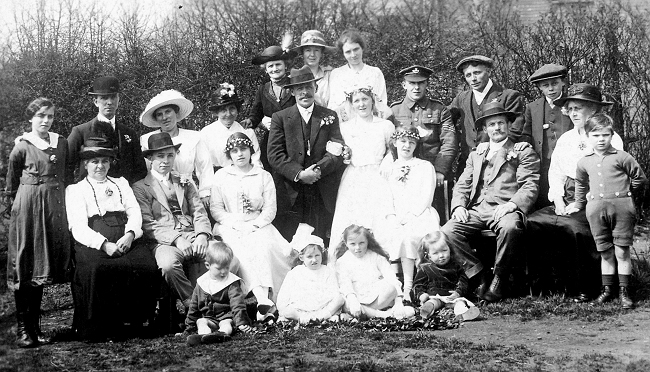 Standing immediately behind the groom in this cropped version of the wedding photo are Fanny and Harry; their daughter Nancy (born 1921, and who died aged just 18 in 1939) is sitting on the bride’s lap and their son Frank Raymond Sylvester (1923-1995) is sitting on the ground at the front. 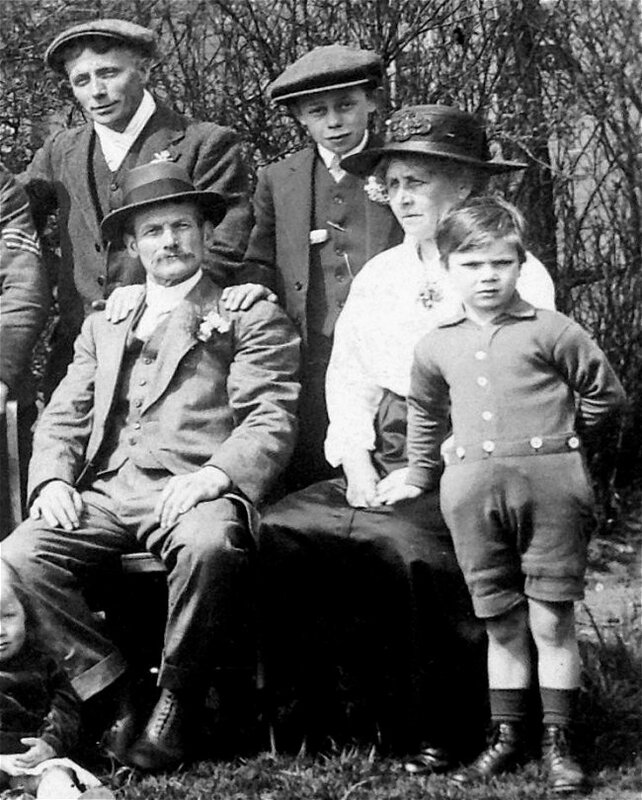 Jack Atcherley can be seen standing next to his sister Fanny, at top left. The image above is cropped from the same wedding picture of 1925. The lady sitting down on the right is Jane Sylvester [ ] (nee Green), mother of the groom. 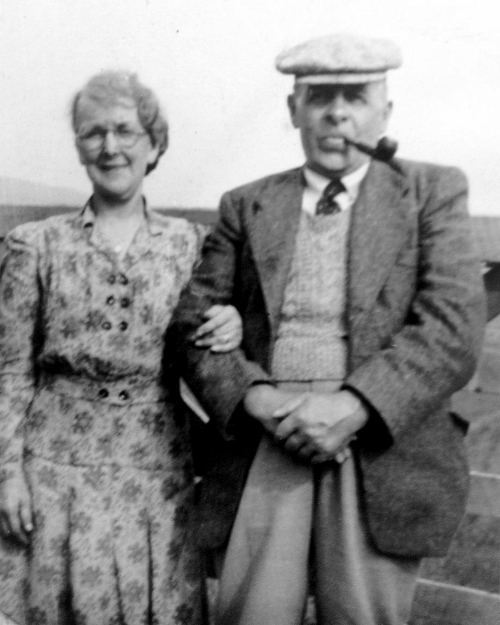 The woman standing on the left is Jane’s sister Hannah, wife of Fanny and Jack’s uncle Richard Atcherley. The girl standing to the right of Hannah, behind and to the left of Jane, is their niece, who was then known as Margaret Trevor [ ]. Five years later on 5 August 1930, at the age of 20, she became Margaret Atcherley when she married Jack (aged 33) at Chasetown. The photos above and below show Harry and Fanny in later life, probably in Chase Terrace, although the locations and dates of the images are not known. Local newspaper reports show that Fanny was a member of Gentleshaw Women’s Institute, and that she and husband Harry, along with her brother and her sister-in-law Jack and Margaret Atcherley, frequently took part in whist drives organised by the village Institute and the local Scouts to raise funds. Fanny died on 20 July 1951 at the age of 57. A photo of her grave marker at Burntwood Christchurch can be seen on the Staffordshire MIs photo page. Until very recently I only knew the very basics about my grandaunt Fanny and granduncle Jack. I know a little more about them now, and am so glad to have become better acquainted!